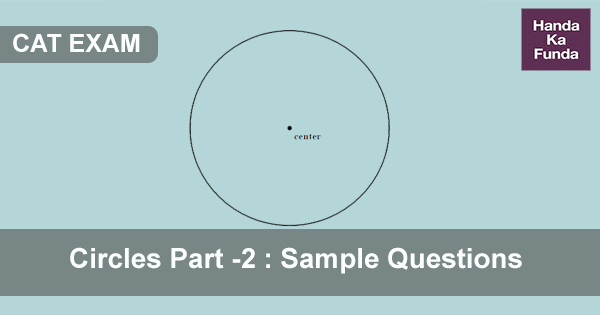 In the earlier post on circles, we had discussed the properties and some sample CAT questions related to circles. In this post, we will see some additional CAT questions which have been asked in the previous years. Let us look at below examples. Example 1: A one rupee coin is placed on a piece of paper. How many more coins of the same size may be placed such that each touches the central coin and the two adjacent coins? Solution: It can be seen in the below figure that if we place 3 coins touching each other, their centers form an equilateral triangle. Hence, the angle made by the centers of the coins around the central coin is 60 degrees. Since the total angle to be covered is 360 degree, there has to be six coins surrounding the central coin. 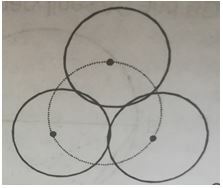 Solution: It can be seen from the below image that , if we place the 3 cones in such a way that they touch each other, it will be similar to placing three circles touching, with vertices of the cone corresponding to the centers of the circles. 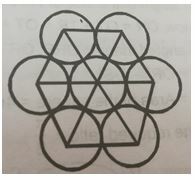 The centers of the circle form an equilateral triangle with each side being 2r. A circle that passes through the centers will be the circumcircle to such a triangle. The radius of the circumcircle of an equilateral triangle is (1/√3) times its side. Answer: Larger than r. Option c.
Example 3: Line AB is 6 meters in length and is tangent to the inner circle of the two concentric circles at point C. It is known that the radii of the two circles are integers. Find the radius of the outer circle. Solution: Let x meters and y meters be the radius of the outer and inner circles respectively and O be their center. As x and y are integers, therefore x + y = 9 and x – y = 1. Hence radius of the outer circle is 5 meters. Example 4: The figure shows a rectangle ABCD with a semicircle and a circle inscribed in it as shown. 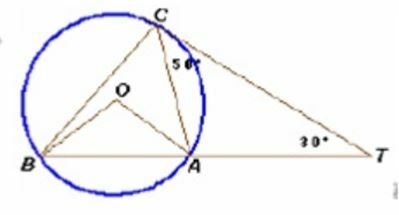 What is the ratio of the area of the circle to that of the semicircle? Solution: Let the radius of the semicircle be R and radius of circle be r. Let P be the center of semicircle and Q be the center of the circle. Now, Draw QS parallel to BC. 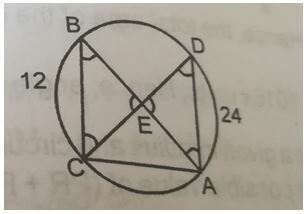 Example 5: In the adjoining figure, points A, B, C and D lie on the circle. 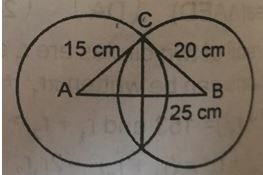 If AD = 24 and BC = 12, then what is the ratio of the area of the triangle CBE to that of the triangle ADE. We know that the ratio of areas of two similar triangles is equal to the ratio of squares of corresponding sides. Example 6: The sum of the areas of two circles which touch each other externally is 153π. If the sum of their radii is 15, find the ratio of the larger to the smaller radius. Ratio of the larger radius to the smaller one is 12 : 3 = 4 : 1 hence option (1) is the answer. Example 7: Consider a circle with unit radius .There are seven adjacent sectors S₁, S₂ , S₃ , …..S₇ in the circle such that their total area is 1/8 of the area of the circle. Further the area of the ‘j’th sector is twice that of (j – 1) sector, for j = 2,….,7 what is the angle in radians, subtended by the arc of S₁, at the center of the circle. Solution: Let the area of sector S₁ be x units. Then the areas of corresponding sectors shall be 2x, 4x, 8x, 16x, 32x and 64x. Since every successive sector has an angle that is twice the previous one, the total area then shall be 127x units. This is 1/8 of the total area of the circle. Example 8: Find length of the common chord of two circles of radii 15 cm and 20 cm, distance between the centers being 25cm. Solution: Let the length of the chord be x cm. 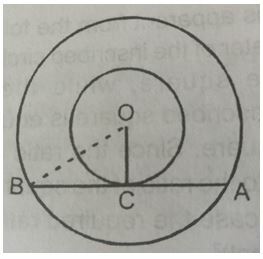 Example 9: In the figure given below ( not drawn to a scale), A, B, and C are 3 points on a circle with center O. 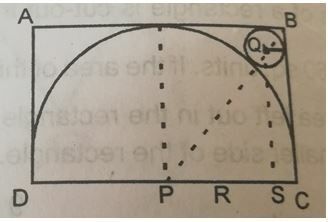 The chord BA is extended to a point T such that CT becomes a tangent to the circle at point C. If angle ATC = 30 degrees and angle ACT = 50 degrees, then angle BOA is? Conclusion: Examples above are a good representation of the types of question asked in CAT examinations. If we are thorough with the concepts of circles (post 1) and these examples, solving questions related to circles should be pretty much doable. Cheers.